Is a member of the Royal Yacht Squadron. He belongs to a well-known yachting family, and was born in 1867. He sat as a Member of Parliament for South Derbyshire for ten years from 1895. Jean, Cutter, 24 tons. Mr. John Gretton. second place in the race for the Heligoland Cup in 1899. 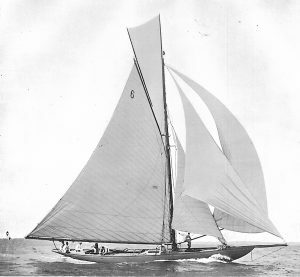 In 1891 he had a 36-footer, and in 1904 Jean in the South Coast one-design class, as well as Eldred, the well-known 52-footer, and the latter boat was in 1898 at the top of her class. In 1899 he bought Thetis, 1-rater, which he altered and raced with some success. He is a well-known member of the Yacht Racing Asso­ciation. Clubs: Royal Yacht Squadron, Royal Alfred, Royal Dorset, Royal Southern. Resi­dence: 66, Ennismore Gardens, S.W.